After Anthony Weiner's third sexting scandal, Huma Abedin announced today the couple is separating. Weiner is a former seven term U.S. congressman and has sought multiple mayoral candidacies of New York City. Ms. Abedin is vice chairwoman of Hillary Clinton's 2016 campaign for President and has also served as the Deputy Chief of Staff to Hillary Clinton during her term as U.S. Secretary of State. The image above and the close up below were taken on the red carpet at the 2016 New York City Metropolitan Ball. From a body language perspective, we can see Anthony Weiner standing with his arms and hands in a "Fig Leaf" configuration. This is sometimes referred to as "Genital Guarding". While there are certainly occasions when a person should use this arm-hand nonverbal signal - such as when standing next to high level clergy, during a wedding or funeral ceremony, when next to a person of high power (particularly when next to them on stage, TV, etc.) - and in these settings it projects deference and respect. Yet in the vast majority of settings the fig leaf should be avoided. Here it sends strong signals of low confidence and low emotional comfort (contrast Weiner's low-energy, beta stance with the high-energy, alpha body language of the police officer in the background). When we evaluate Mr. Weiner's facial nonverbals, we can see can see strong signals of emotional dissonance. His mouth is forming a "Blocked Inward Lip Roll". An inward lip roll is a common facial signal seen when the subconscious is trying to suppress strong emotions from growing further. It's also used to avoid a more full outward expression from crescendoing. 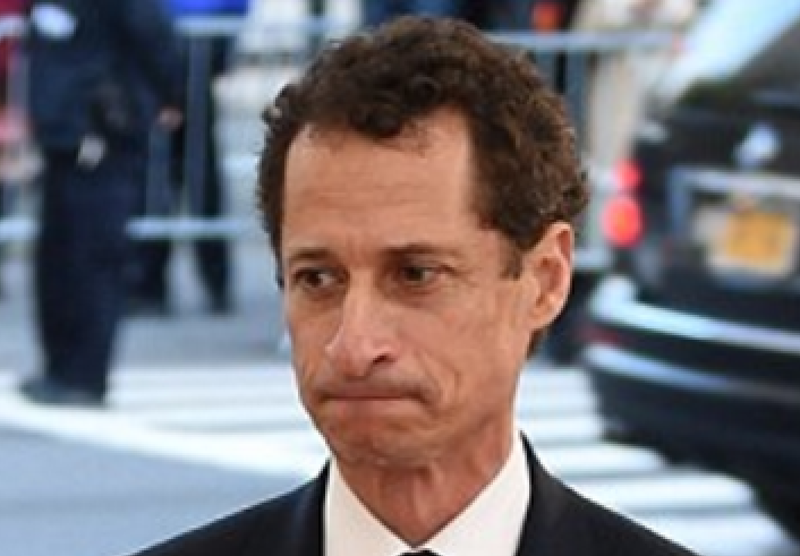 Here the typical inward lip roll cannot be fully formed because of Weiner's jaw clenching. His tighten jaw muscles can be easily seen and is further highlighted by the dimpling on his chin. Note also the extreme tension of his "mustache area" as well as his dramatic flaring of his nostrils. There is also significant tension of his lower eyelids. Conclusion: Anthony Weiner displays significant emotional dissonance. His face projects anger and frustration while his fig leaf hand position is an attempt to very literally cover up what he has otherwise inadvertently made very public.